Ensure the painted surface you are going to wash-technique onto is of good quality and that the paint is well dry. 1. Dampen a piece of rag in water and squeeze to remove any excess water. 2. Apply paint onto the rag and ensure that it is evenly distributed all over the rag (not too much paint though). 3. Fold the rag like a ball in the palm of your hand. Fold all the ends away to ensure that the cloth is placed evenly in the palm of your hand. 4. Evenly and with very light pressure move cloth in circular movement onto the painted surface to start creating a mottled and washed effect. 5. Once one colour is done and has dried (more or less 30 minutes) the process can be continued with other colours. 6. We started with Dons’s wash, then did Cloud White and Shorty’s Story only in the corners. Visit www.tjhokopaint.co.za or mail nadine@tjhokopaint.co.za for more help. Shake your bottle of Tjhoko Paint, unscrew the lid and pour a little paint in the paint tray. Rather work with a dry foam roller than a roller too wet and filled with too much paint. The dryer and the less paint the greater the success. Lightly roll the foam roller over the stencil secured to the wall with masking tape. Remove the stencil and repeat the process to complete the stencil work. Rather work with a dry foam roller with little paint evenly distributed in the roller to prevent paint from leaking underneath the stencil. If leaking occurs, wait for the paint to dry, repaint that part of the wall and once paint is dry apply stencil work again. There are various ways of applying a whitewash technique to an interior raw brick wall. The first method is to dilute Tjhoko Paint with an equal quantity water. 250ml Tjhoko Paint in a colour of your choice can be diluted with 250ml water. This will more or less cover an 8 square meter surface. Dip a damp cloth (more or less the size of a kitchen towel) in the Tjhoko Paint and water mixture and wash/wipe onto the wall. If you find that the brick surface absorbs most of the paint colour, more paint can be added to the mixture. The second method is to simply paint small sections onto the wall and wipe and blend the Tjhoko Paint with a damp cloth onto the wall surface. More than one colour can be used. Just important to remember is to work small areas at a time to ensure that you can still wash/wipe the paint before it dries. There are various ways of applying a whitewash technique to an exterior raw brick wall. The first method will be to dilute Tjhoko Paint with an equal quantity Tjhoko Clear Glaze. 250ml Tjhoko Paint in a colour of your choice can be diluted with 250ml Tjhoko Clear Glaze. Dip a damp cloth (more or less the size of a kitchen towel) in the Tjhoko Paint and Clear Glaze mixture and wash/wipe onto the wall. If you find that the brick surface absorbs most of the paint colour, more paint can be added to the mixture. More than one colour can be used. Just important is to remember to work small areas at a time to ensure that you can still wash/wipe the paint before it dries. After 4 hours dilute the Tjhoko Clear Glaze with 30% water and wipe with a damp onto the washed surface. Method: Dip a damp cloth in the Clear Glaze and water mixture and squeeze the cloth to remove excess moisture. Wipe onto the washed surface. Once cloth is too dry dip in mixture and repeat the process. The Tjhoko Clear Glaze adds extra protection to paintwork exposed to UV and moisture. Tjhoko Paint has a build-in sealant and therefore it will grip to the surface being applied on. Important to remember is that the surface needs to be oil free, grease free and not recently varnished. Wet a cloth with Thinners, make sure the cloth is wet and start wiping the surface clean. All furniture polish, oil or greasiness needs to be removed. Wait approximately 20 minutes or until thinners has dried completely and only then start to paint. Use a paint brush and start painting the surface. While paint is still wet use the foam roller and lightly smooth out or remove slight paint bristle marks on the surface. It is normal for air bubbles to appear, just continue to lightly roll with the foam roller on the painted surface. The more you roll, the more the air bubbles will disappear. The foam roller gives a very smooth finish to your paint work. Start with your second coat and repeat the process. In most instances 2 coats of paint is enough but there might be exceptions where a third coat might be needed. Wait for paint to dry before adding detail with shadows. In crevices and on detail use an artist brush and paint small pieces at a time. Paint small areas at a time and wipe with the damp cloth and blend to ensure and even distribution of the paint. We used Sherif Stone. Lastly we dry brushed with Vinia Stone, Stefann of Silver Moon. Apply very little paint to your paint brush and ensure that it is evenly distributed on the paint brush. Move with gentle and even brushed strokes on the areas where you want to apply a very subtle brushed finish. Only Glaze 4 hours after paintwork has been completed. To create a subtle satin finish. Tjhoko’s Glazes are water-based. 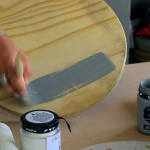 You therefor can paint on top of Glazes again, should you want to. Dilute Clear Glaze with 30% water in a different container. Depending on the size of the surface you can dilute 100ml Clear Glaze with 30ml of water at a time. Use a clean, colourless piece of cloth (mutton cloth or T-shirt material) and dampen the cloth with water. Squeeze and remove any excess water. Dip the damp cloth in the Glaze mixture and once again squeeze to remove excess Glaze mixture. Wipe very evenly onto the painted surface. Work in a well lit area to ensure that the entire surface is covered and that no blank spaces are left un-glazed. One glaze coat is enough. When a higher satin finished is required a second coat of Glazed can be applied. When the cloth becomes dry or sticky, rinse in water and repeat the process. When applying Glaze on a flat surface, wait 48 hours before using the surface. Clean the surface being painted with a cloth dipped in some thinners and thoroughly wipe the surface down. Wait more or less 20 minutes and then paint the frame of the door in Sherif Stone. Wait for first coat to dry (more or less 20 minutes) and then paint the second coat. Once the second coat is dry use a clean, dry paint brush. Add little paint (Cloud White) to the brush and evenly distribute onto the brush. Use even and light movements onto the painted surface. This will create a brushed effect. Paint the background in Coral Stone. It is a good base colour to work from. Start combining different streaks of paint in different colours close to each other. Use a clean paint brush and brush over the areas where two colours touch to blend the colours together. Important tip: One can only blend colours together when both paint colours are still wet. So work small areas at a time in order to blend colours before the paint dries. Tjhoko Paint is also a chalk board paint and the painted surface can now be used as a chalk board. This means you can write with chalk on the painted areas once the paint is completely dry. 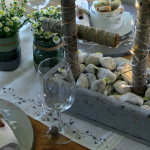 Episode 3 – Decorative crates for Mothers Day. Select a Tjhoko Paint colour of your choice (Tjhoko Paint is an already sealed product, thus there is no need to add a wax, primer or sealant to the paint), using a clean brush apply the paint to the crate. After the paint dried use pure petroleum Vaseline and random apply generous amount of Vaseline to the crate surface. Select a second Tjhoko Paint colour and paint over the entire surface coated with the Vaseline. After the second coat dried, use a paint scraper to remove the Vaseline covered by the second layer of paint. Use a scotch pad and wipe it over the surface to remove the excessive Vaseline. Select a third Tjhoko Paint colour and repeat the above mentioned steps. After the paint dried apply Tjhoko Paint’s Antique Brown Glaze to add depth and definition (stir/mix glaze before usage) – there is no need to dilute the glaze when working with small surfaces. Using a clean brush apply the glaze and very quickly before the glaze has dried, wipe some of the Glaze from the surface with a damp, clean cloth. Wipe the glaze over the surface with a damp cloth to obtain extra depth and dimension on the surface.Remove as much Glaze as needed with the damp cloth to create the effect you like best. Select a Tjhoko Paint waterslide transfer of your choice. Soak the desired design in cold water. Once the transparent film loosens from the paper (takes between 1 – 2 minutes) the design is the ready for the next step. Place the design on the crate and carefully slide the paper from underneath the transparent film. Remove the excessive water and air bubbles with a dry cloth by slightly wiping over the transfer. 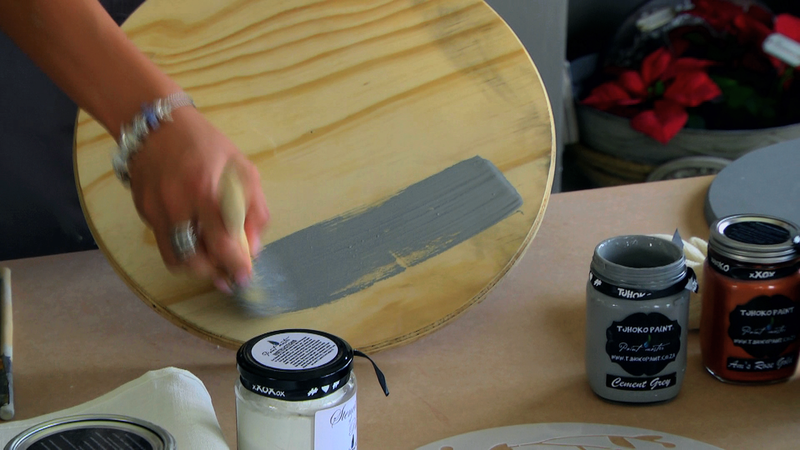 Using Tjhoko Paint’s Clear Glaze secure the transfer by applying a top coat of clear glaze with a damp cloth. Always ensure that surface being painted is clean and grease-free, no need to apply a primer or to sand. If it was previously waxed, then you’ll have to sand before painting. Paint photo frame in a Tjhoko Paint colour of your choice. Wait more or less 4 hours for paint to properly cure before applying the Antique Brown Glaze. Open the Antique Brown Glaze. Give the bottle a good stir. Dampen a piece of cloth with water. 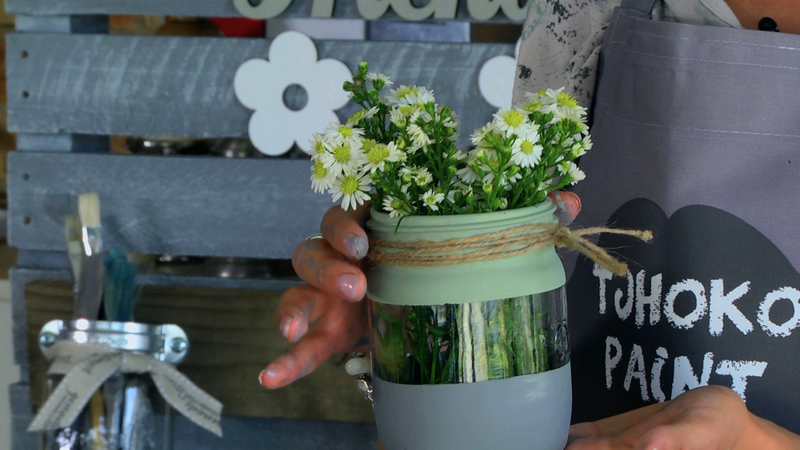 Dip paint brush in the Glaze and paint small areas at a time onto the painted photo frame. 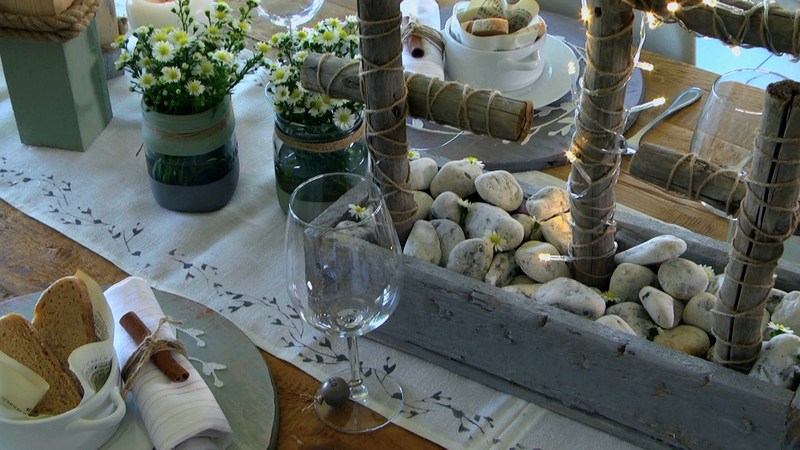 Use the damp cloth and wipe Antique Brown Glaze off again until the desired shade and effect are created. Any imperfections can be corrected with a dry-brush technique in the colour initially used on the frame. Next use Charm’s Silver and dry brush the frame with this metallic colour or any other metallic colour from Tjhoko Paint. Use a clean, slightly dampen cloth to wipe away any unwanted streakiness. This will also create a more even blended effect on the frame. Our under plate is plywood surface. No need to sand or prime. Paint in a colour of your choice. We used Cement Grey. Wait for paint to dry (more or less 5 minutes). The paint dries quickly because with a dry brush technique you use very little paint. Wait for paint to dry (more or less 5 minutes). 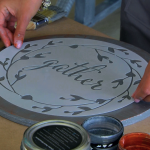 Choose a stencil in a design of your choice and secure it onto the under plate using masking tape. 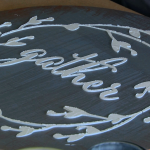 We used the Gather under plate stencil. 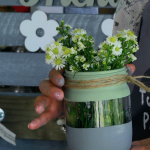 Take some Stencil of Paris from the jar with a paint scraper and apply evenly with the paint scraper on top of your stencil. 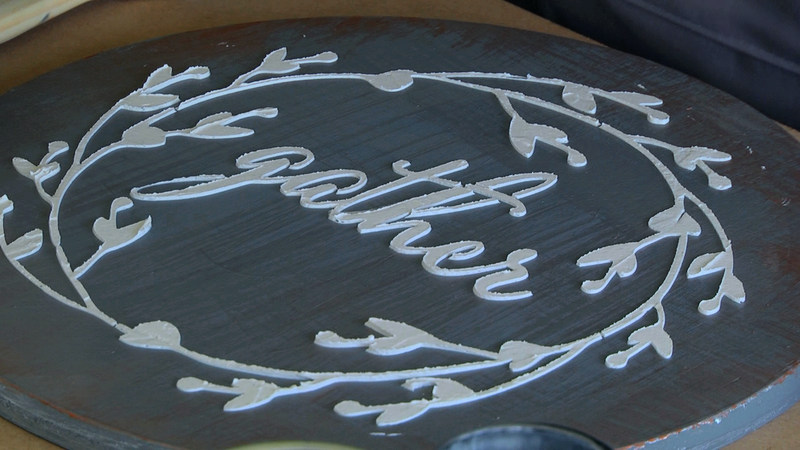 Remove the stencil slowly while the paste is still wet. If you want to make the surface water resistant apply Clear Glaze onto the under plate more or less 4hours later. Wipe Glaze on with a cloth. Dry Brush is a technique where you use very little paint on a dry paint brush and make sure that paint is evenly distributed onto the paint brush. Give light brush strokes onto the surface being painted to create a subtle distressed finish. 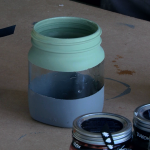 Apply masking tape onto glass jars. Make sure that no paint can leak in underneath the masking tape. Firmly secure masking tape onto the glass jar. Paint straight onto the glass in the colours of your choice. We used Cement Grey and Olivia’s Pale. Wait for paint to dry and then remove the masking tape. Paint takes longer to cure on a smooth surface like glass. It will still take more or less 20minutes to dry but will need to be left overnight before washing it. It is not dishwasher safe and also should not be soaked in water, but can be rinsed and should be dried immediately. Hold stencil firmly onto the fabric. 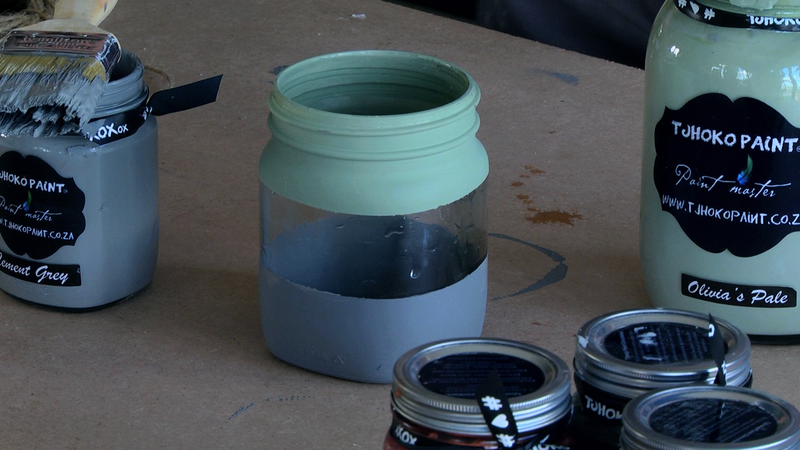 Use a stencil brush and dip it into your paint. Remove most of the paint from the stencil brush. The less paint the better, else the paint will leak in underneath your stencil. Move the stencil brush in circular movements over the stencil, ensuring that you don’t move from the border of the stencil onto the fabric. Stay inside the design of the stencil. 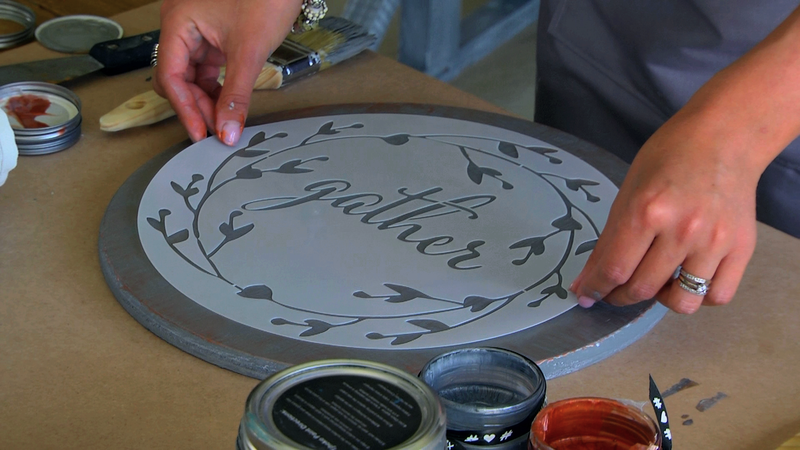 Lift the stencil and repeat the process to complete the border design. Most important have fun, think creative and create something amazing using Tjhoko Paint. All the products are water based and you can paint onto the Glazes. Anything can be corrected – relax and create!